After learning all about Groundhog's Day at school recently, Big Sister E was beyond thrilled when Punxsutawney Phil didn't see his shadow and an early spring was declared. Summer is going to be here soon! Mama, get my shorts out! It's going to be warm soon! And so on and so forth. I couldn't help but laugh at her innocent and enthusiastic optimism. Unfortunately, as much as I wouldn't mind warmer weather to be here immediately as well, I'm realistic in knowing that we've still got quite a bit more winter to make it through before those shorts are really going to be needed. Which means more snow, more heated blankets, and more days of gazing out the window and wishing that we could just get out there and play without having to bundle up (and still freeze). 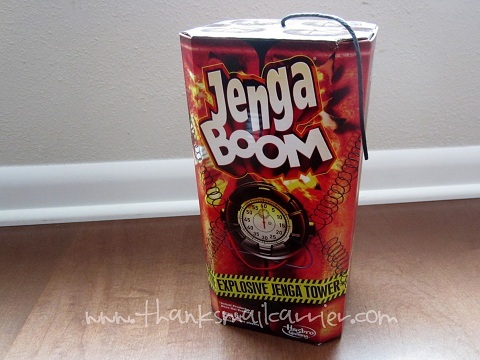 Fortunately, evenings and weekends indoors don't have to mean that we can't have any fun, especially now that we have added the excitement and suspense of Jenga Boom to our lives. 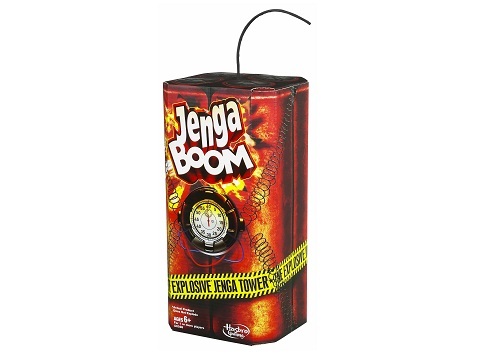 New to the Hasbro lineup, Jenga Boom is a twist on the classic Jenga by adding in the excitement and suspense of a ticking time bomb. As well as having to have the skill and concentration to pick out the perfect block to pull and stack on the top of the tower, you have to have speed and quick fingers to get it done before the blocks come tumbling down! Considering I've always been a ran of the original Jenga, I was immediately interested in seeing the difference and fun that this modern version could provide. Along with the 36 hardwood Jenga blocks, this game also comes complete with a stacking sleeve and a toy detonator, all of which easily come together into a tower in only a few quick steps. When it's time to play, it simply takes pressing down the orange lever on the back of the platform to get it set, pulling the fuse cord all the way out, and pressing the "play" arrow on the timer at the start of your turn. Then the race against the clock is on! Each player takes a turn strategically selecting a block to pull out, which is then stacked on the top of the tower as fast as possible. At the end of their turn, they press the "stop" button on the timer and play moves to the next person. The last person to place a block on top without the tower tumbling down is the winner! Both Big Sister E and Little Sister B have had a great time carefully pulling their blocks from the Jenga tower and giggling as the whole thing slightly wobbles but continues standing. In true Jenga form, not only will picking the wrong block put the entire tower off-balance, but if the seconds run out on the timer then the tower comes crumbling down as well! Providing just as much entertainment, skill and strategy (and a bit of luck) as the original, this innovative game is a great addition to any game library. Designed for two or more players ages 6 and up, Jenga Boom has been an entertaining way to add some excitement and suspense to our game night, as we all get a good laugh out of racing the clock and showing off our balancing speed! 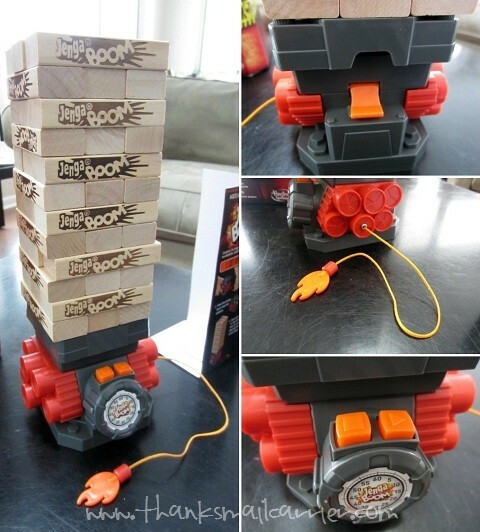 If you're ready for an explosion of fun in your home as well, Jenga Boom retails for $17.99 and can be purchased directly from Hasbro, on Amazon.com, in stores near you and more. You can also keep up with all things Game Night by connecting with Hasbro on Facebook and Twitter. 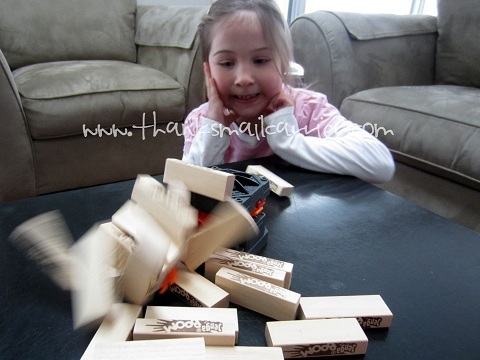 One lucky person will win Jenga Boom from Hasbro! 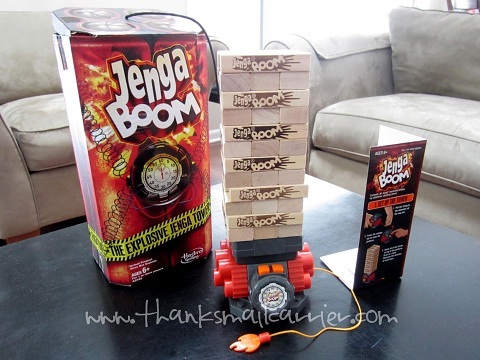 A big thank you to Hasbro for providing Jenga Boom for me to review as well as for one lucky giveaway winner. The opinions shared are my own and honest and if you really need to see more, click here to see how I roll. I love playing Sorry with the kids. This looks like so much fuN! I love this card game called Wild 13. We love the game "Sorry"
We love scrabble and trouble. Love Monopoly and Yahtzee, thanks so much for hosting this great giveaway! Our favorite games are Uno and Yahtzee. I very much love to play Rummikub! I like Scrabble and the Game of Life. I love playing Scattergories with my family! So much fun! I think clue is our favorite here. We like to play Skip-Bo. our family loves to play Uno! hee hee, right now I play Thomas matching game 70 times a day, but I have always loved scrabble! I like Scrabble! Thanks so much for the fantastic giveaway! We love Risk, Monopoly and Scrabble here at our home. Right now our favorite family game night game is Sorry! candy-land was our favorite, but we just moved up to sorry. Little sad he's getting older. Tripoly is my fave card game. My favorite board game is Game of Life. My favorite card game is Rummy. I like Scrabble because its a challenge! I think my favorite is Life. Although we are all game night junkies. CLUE is my fave group game & Regular JENGA is my fave game. I love Scrabble and Monopoly. My favorite board game is Scrabble, but no one in my house can play it with me quite yet. I will always love Monopoly. I love any card game with my family! Hand and Foot is a fun one! I am a huge love of word games like Scrabble and Boggle. I also like Apples to Apples! Our family likes uno, cause we still have younger kids. We like to play cribbage. Trouble has been a favorite for me and now my kids! My son currently loves sorry! We play Monopoly the most often! Yahoo is a favorite. It's like sorry. My favorite game has always been Clue. I LOVE it. I love Boggle and Scrabble. Current fav in my house is Monopoly. Thanks for the chance! I liked hungry hippos, frustration and cluedo. Trivial Pursuit, and now the Game of Things. My little boy and I love Monopoly. I like the Scene It games, and Monopoly. Monopoly is on of my favorite games. My favorite board game is "Life".